Make-up is always an issue when it comes to Morgellons. Seems like what you used to do with make-up is out the window--the organisms eat it up and love it. . Here are some tips from Elle. When I was first infected I threw out all of my make-up and went without entirely. Surprisingly, I got used to not wearing make-up and have since adjusted my routine to use far fewer products which is better for my skin anyway! I feel as though my skin looks more natural, even-toned and healthier as a result of using NG and having a couple of months break from skin products. When I was ready to use make-up once more, I purchased a cheaper brand (in case of re-infection) from Target, the brand name is Elf and has proven to be surprisingly good quality as well as terrific value. Some of their products are Italian made and are just as good as the designer brands I used to buy. They also have very inexpensive but rather good quality brushes. Firstly, I use Elf’s all over bronzer for a healthy glow. I only use the brush on the palette ONE TIME to avoid infecting the makeup and then swish it all over my face for that glow. The bronzer has a slight gold tone to it which provides a few highlights on eyelids too, if desired. Every time, I wash the brush in NG and leave it to air dry. I also use a similar technique for eye shadow. Eye-liner for me has gone by the wayside, I just don’t bother, and don’t miss it, however, I do have subtle permanent eyeliner as well as eyebrow enhancement, which I had done a few years ago because at the time I was a long distance runner and swimmer. This process is called dermapigmentation and is done by a professional. For me it was wonderful and I can highly recommend it, but I would encourage you to do a lot of research first to find someone who can work with your parameters. Next, I use Burt’s Bees colored lip balm which I use in place of lipstick. Also, I buy cheap lip gloss and toss after a couple of weeks of use. Rather than an inconvenience, I find it fun to try different colors and new brands, and, it is a great way to discover a new favorite. I use mascara only occasionally, again, an inexpensive brand and dip the wand only ONE TIME, after which the wand is completely wiped off with a dry tissue followed by a damp NG tissue before replacing. I really like Karen’s idea of adding NG to make-up and will also try it and let you know my thoughts. I thank Elle for taking the time to share her experiences. 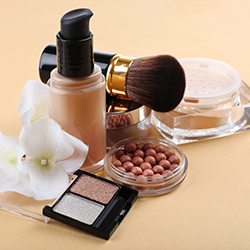 Remember, we also have the Bare Minerals line of products in our store.